(Nanowerk News) Physicists at the University of Washington have conducted the most precise and controlled measurements yet of the interaction between the atoms and molecules that comprise air and the type of carbon surface used in battery electrodes and air filters — key information for improving those technologies. 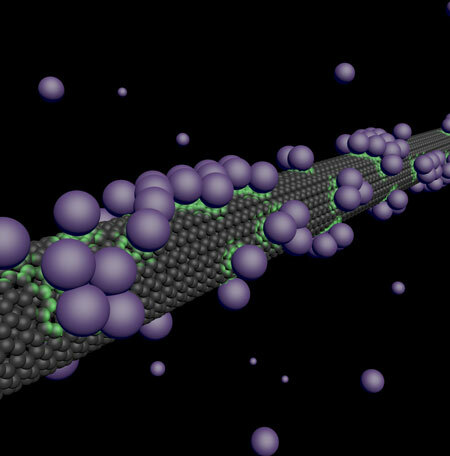 A team led by David Cobden, UW professor of physics, used a carbon nanotube — a seamless, hollow graphite structure a million times thinner than a drinking straw — acting as a transistor to study what happens when gas atoms come into contact with the nanotube’s surface. Their findings were published in May in the journal Nature Physics ("Surface electron perturbations and the collective behaviour of atoms adsorbed on a cylinder"). Cobden said he and co-authors found that when an atom or molecule sticks to the nanotube a tiny fraction of the charge of one electron is transferred to its surface, resulting in a measurable change in electrical resistance. Lithium batteries involve lithium atoms sticking and transferring charges to carbon electrodes, and in activated charcoal filters, molecules stick to the carbon surface to be removed, Cobden explained. This work, he said, resulted in the most precise and controlled measurements of these interactions ever made, “and will allow scientists to learn new things about the interplay of atoms and molecules with a carbon surface,” important for improving technologies including batteries, electrodes and air filters.